Dr. Sana Singh named new Director of Partnership Missions. What could be more fitting than to see one of those saved through a ministry grow strong in faith, seek theological training, immerse themself in a lifetime of ministry, and rise to the occasion to lead the missionary enterprise itself? Dr. Sana Singh, the new director of Baptist Mid-Missions' Partnership Missions, holds a tremendous advantage as a liaison between American and Asian churches: he is our first Asian national to lead the ministry. Dr. Singh grew up in northeast India and was saved in 1964 during a gospel presentation at BMM's Makunda Leprosy Hospital, where his father had been on staff. During college he took active part in the evangelism ministry of the local church and helped his mentor, missionary Jim Garlow, translate Sunday School materials into Bengali. He joined the Indian Army as an officer in 1969. Sensing God's call to ministry, Dr. Singh resigned from the Army in 1973 and accepted an invitation to become General Administrator of the Makunda Leprosy Hospital. 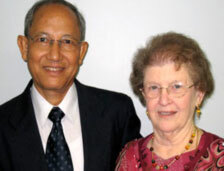 There, he met BMM missionary Nancy Lewis, and they married in 1978. In 1985, Dr. Singh sensed the need to get further training. He and Nancy moved to the US, where he earned an MDiv, ThM, and later a DMin at Baptist Bible Seminary in Clarks Summit, Pennsylvania. As Dr. Singh studied Greek, he realized that he could help produce a much better translation into his own and other Asian languages. In 1992, he and Nancy became the first national staff members for Bibles International (BI), BMM's Bible translation division. They joined as full-time BI missionaries in 1997. Dr. Singh has since been working with BI as a translation consultant on more than 15 language projects in India and Myanmar. The Singhs also helped start two churches, the most recent at Pailapool, India, where he is a pastor. As new PM director, Dr. Singh plans to continue the good work already done through Partnership Missions. His desire is to make the most of the enormous potential of fulfilling the Great Commission in Asia by strengthening churches, training new workers, and sending them out to start their own churches. Partnership Missions (PM) operates on the premise that nationals can best reach nationals with the gospel, especially in areas where foreign missionaries are prohibited. Through help from North American churches, Partnership Missions provides Asian churches with needed resources for ministry training, evangelism, discipleship, and church planting. As PM director, Dr. Singh will partner with church associations in India and Myanmar to help them use these resources with the wisest stewardship possible. As an Asian national who fully understands the culture and people, and who has already worked with some of these church associations, Dr. Singh can easily move into his new role. And, being based out of India, he will be on-site many more months out of the year than previous American PM directors could be. Also, as Dr. Singh seeks PM partners in the States, he has a strong American connection through his US-born wife, Nancy, and through studies done in the US. Partnership Missions is working to see the Great Commission fulfilled by assisting Nationals to reach their own people in countries where American missionaries cannot live and work freely. By carefully partnering with local churches in Creative Access Nations, Partnership Missions is able to aid in evangelism and discipleship, in training nationals for ministry, and in planting churches. As a result, those churches are training people for ministry and sending their church planters into closed counties. This is done through partnership, so as not to create dependency. As a result, there is national ownership, responsibility and accountability. Your can help with prayer and financial assistance. You can be involved in the Great Commission!